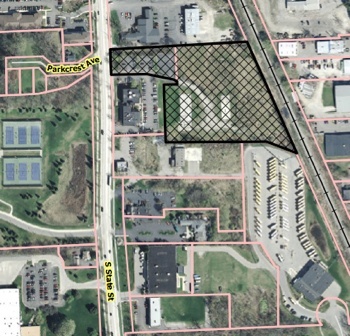 A proposed 78-unit apartment project on South State Street took another step forward, following action at the June 17, 2014 meeting of the Ann Arbor planning commission. Commissioners recommended approval of a site plan, development agreement and rezoning for the State Street Village, a $10 million project put forward by Ann Arbor-based McKinley Inc. at 2221-2223 S. State St. The plan calls for constructing two 4-story apartment buildings at the rear of the site, totaling 112,262 square feet, with 38 units each. Another 2,027 square foot building – for a leasing office with two apartments above it – would be built on the front of the parcel, on South State. Commissioners spent about 30 minutes asking question and pressing McKinley to go beyond what the code requires in terms of pedestrian amenities, a reduction of impervious surfaces, and stormwater management. “We’re putting our aspirations on you,” Bonnie Bona told them. The vote, which came near midnight, was unanimous – with only six of nine commissioners present.